I was speaking to a friend the other week who wanted to start her blog. She had purchased a domain name, figured out her platform, created some graphics, but she was afraid because she didn’t know what to write about. She told me, “I have so many ideas and interests that I don’t know which one to pick. I really need to find my purpose first. I can’t blog until I know what I want to be and then I will have a central theme and then I can start. ” How long do you think she had been searching for this elusive purpose? A year! Like my friend, it has taken me longer than it should to start blogging. I made the same mistake of thinking I needed a purpose first. Conventional wisdom would have us believe that we should all know what our purpose is and luckily some of us do. But for those of us that don’t, don’t let that stop you like it stopped me. The trick is simply to start. Like I told my friend, “Take the pressure off yourself, it is only in the doing that you will find it”. So what did I do? As someone who works in collaboration, social media and community building – there is no one word that describes what I do, let alone blueprints to follow. The practice is constantly evolving. So I have learnt to reflect, learn, and adapt as I go along. One way to do this, is to use your blog as part of the reflective process. This habit of reflection, processing, and articulation helps form my thinking and allows me to work in such a way as to solicit feedback and ideas. This concept is not new. In his 1983 textbook The Reflective Practitioner, Donald Schön explains to us in 300+ pages the importance of reflection in learning. This book used mainly by health professionals and teachers, guides practitioners to build up a collection of examples and actions they can draw upon in practice. Schön defines reflective practice as the practice by which professionals become aware of their implicit knowledge base and learn from their experience. He talks about reflection in action and reflection on action. Reflection in action is to reflect on behaviour as it happens, whereas, Reflection on action reflecting after the event, to review, analyse, and evaluate the situation. And… “knowing in action” to describe tacit knowledge. Reflective practice, though recognising the value of private reflection, opens up for public scrutiny our interpretations and evaluations of our plans and actions. We subject our assumptions, be they personal or professional, to the review of others. We do this not only before or after an event, but learn to inquire even in the heat of the moment. A more accessible way of looking at this, is to turn to the work of John Stepper or Jane Bozarth and say we should Work Out Loud. As professionals we are constantly learning from our experiences. By opening these experiences up for feedback, we not only build credibility and reputation, we increase our network and get better at what we do. Writing not only about what we did, but sharing why and how too. Helping not only ourselves, but those within our network. These reflections help build a repertoire and evolve the practice. Start sharing your work and in the sharing the purpose will come. It’s not just for people. This is true not only for people, but for communities and organisations too. By offering our experiences we can learn, process and evolve on the journey. In a previous post I wrote about the KEA community. This community may already know their purpose, but by having meet-ups and network events, hosting online discussions and connecting like-minded people, KEA can evaluate where they are having the most impact. By writing about these experiences and involving the community in those learnings, they evolve and continue to get better. Every organisation can do this. 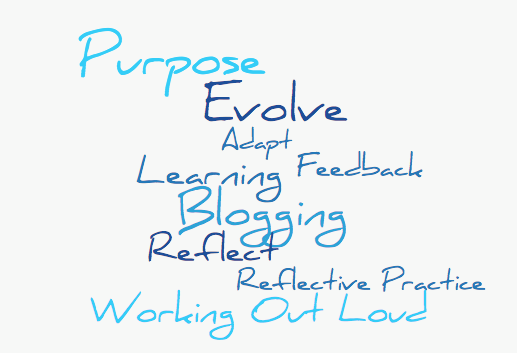 Rather than waiting for your purpose, like my and friend and I did, try blogging as a reflective practice. Simply Work Out Loud and invite feedback from your network. By working in this way you start to better understand yourself and what you do. And you never know, you may just find your purpose along the way.